Twice a year trout migrate from the lakes into the streams and rivers that flow into them. Some species travel upstream to spawn in the fall, like brown trout, brook trout and salmon. Another species of trout, the rainbow trout, migrate upstream in the spring to spawn. Anglers take advantage of this bi-annual run of fish and stalk wary lake-run trout in the pools, runs, riffles and eddies in streams and creeks swollen with run-off. 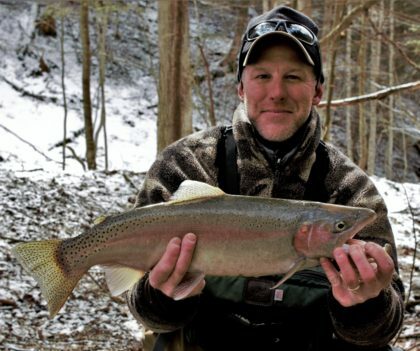 In the Finger Lakes on the first day of April each year hundreds of anglers descend upon the creeks flowing into the lakes to catch spawning rainbow trout. In some biological logic the fisheries managers of New York State decide which trout are allowed to be fished for while they struggle to reproduce and which ones are off limits. The rainbow trout is the most stocked species of trout in the country. Each year New York hatcheries raise tens of thousands of these fish and release them in state waters. 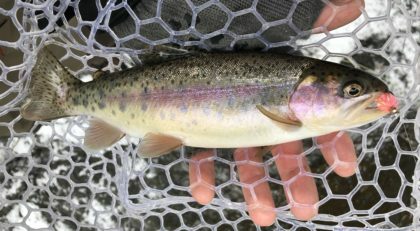 I was told once by a biologist that most years the majority of lake-run rainbows have run-up the creeks and spawned and left before the statewide trout season opener. This year, and many others I can remember, winter like conditions lingered on in Upstate New York and on April 1st the rainbows were caught up the creeks in huge numbers while they were in the act of spawning. The brook trout is a native char species that has been swimming in many natural ponds and cold flowing creeks of New York State since the last ice age. They are protected during their spawning season. Most statewide waters that contain natural populations of brook trout are closed to fishing after October 15th of the year, just about the time this species is beginning to enter into spawning mode. Brown trout also are protected in many Central New York trout streams where they are found to be naturally reproducing. In many other places they are allowed to be fished all year long. Why are they protected in some waters and not in others, I think, has to do with habitat and water quality. A stream that has good habitat and water quality where brown trout thrive is, in general but with some exceptions, closed after October 15th of the year, allowing the brownies to go about their reproductive business unhampered. On streams that are borderline in habitat and water quality, where brown trout must be stocked to maintain their population, angling is allowed all year. I once overheard a fisherman on a local creek that had five recently stocked trout strung on a metal stringer say “I buy a fishing license so I am going to get as many of these trout as I can”. That statement is maybe ridiculous. As if by buying a fishing license he inadvertently paid for the dying trout on his stringer. There is perhaps some rough logic here. Is it likely that state fisheries managers, when determining what trout can be fished for and when and which ones cannot, are influenced more by perceived public opinion than what would be beneficial for the propagation of naturally reproduced trout? And is the species of trout a factor when determining the open season for particular trout on particular waters? Is this the state’s way of saying “Hey, we grew these fish with money from license sales so go get them”. If the trout were protected during their spawning cycle wouldn’t that mean less trout would need to be reared in hatchery ponds? Perhaps not. I am not an ichthyologist. This blog is just some thoughts and opinions. The pics in this blog do show an interesting story however. The larger trout at the top of the page is a wild rainbow caught in the open lake a couple seasons ago. It is assumed that it was born in a tributary and survived to adulthood. The small trout in the pic at the top of page is a wild, naturally reproduced rainbow trout caught a week ago from a somewhat remote tributary of an eastern Finger Lake. Gorgeous little fish. 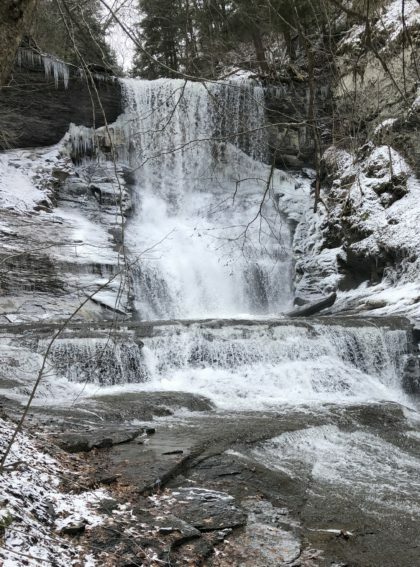 What makes this little wild trout interesting, besides the fact it is wild, is that it was caught hundreds of yards upstream of an impassable waterfalls as seen in picture below. Also pictured below is an adult male rainbow trout, caught the same day, that appears to be of stocked lineage, caught on a fly several hundred yards downstream of the waterfall. The male rainbow was with a female or hen rainbow and was in this tributary going through the motions of spawning. I released both the trout. And both are living proof that rainbow trout do spawn and successfully reproduce in this stunning creek. How that trout found its way above that waterfall is one of natures great mysteries!. This beautiful little tributary is a place where stocked trout have found an ideal place to reproduce. I learned about this place many years ago. In a phone conversation (some fifteen years ago) with the state biologist overseeing Skaneateles Lake, I mentioned how it would be great if the state closed this creek to fishing during the spring months and let the trout reproduce without aggravation from anglers. In that phone conversation I was told my idea was a good one but not feasible. The biologist knew there was some natural reproduction taking place in that particular tributary and others, but it is not significant enough to sustain a viable (catchable?) population of rainbow trout in such a popular lake. That determination, I assume, is based upon fishery science and popular opinion, or a combination thereof. 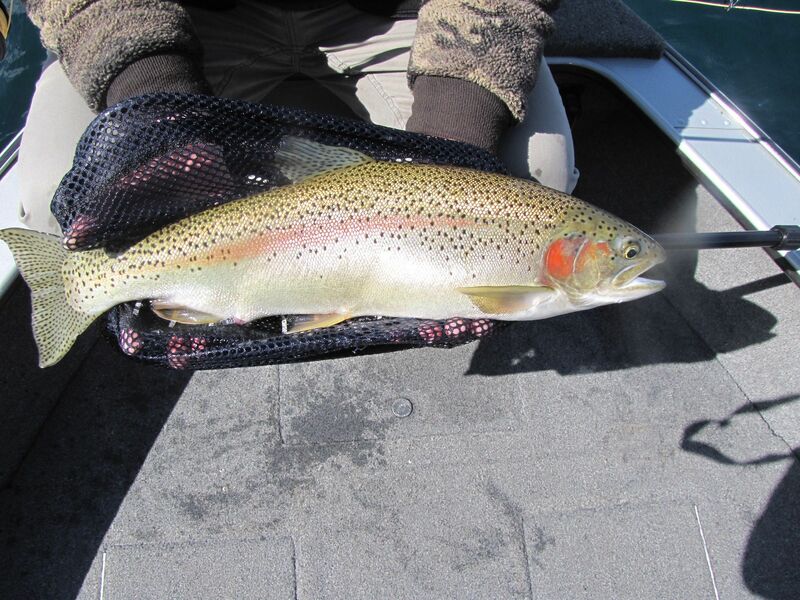 “The contribution of rainbow trout in the NYSDEC-sponsored Skaneateles Lake Angler Diary program has declined in recent years and the reduced harvest limit on this species is proposed to help reverse this trend. Additionally, greater protection for Rainbow Trout is also warranted because natural reproduction in the tributary streams in some years contributes significantly to the lake-wide population”. The over-worked and resource-deficient state fisheries managers get my respect and I hope this blog would not be interpreted as critical of their important work and difficult decisions. This blog is rather just my musings and a platform for my thoughts…And a way to share cool pics with readers!